Matt Barkley staying at USC, how does it affect the Miami Dolphins? 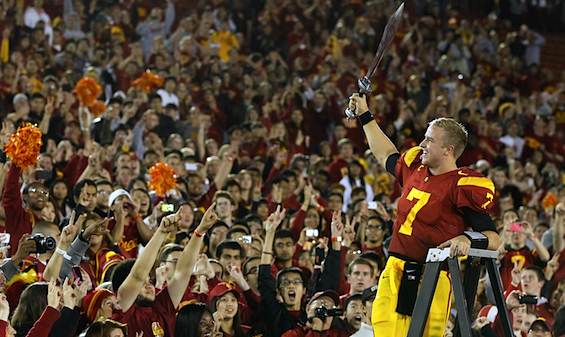 Matt Barkley gave USC an early Christmas gift after making his announcement on the decision to stay for another season Thursday. The Trojans’ quarterback was a player on the Miami Dolphins’ 2012 NFL Draft board, but now they can cross him off their wish list. The Miami Dolphins’ chances on finding a long-term franchise quarterback are becoming smaller. Coincidentally, the Dolphins thought Barkley would be the answer to the quarterback position. He arguably was the most NFL-ready quarterback on the board behind one of the Heisman finalists Stanford’s Andrew Luck. This season, Barkley has recorded 3,528 passing yards, 39 touchdowns, and seven interceptions with the Trojans. Since we can only fantasize watching the USC combination of running back Reggie Bush and Matt Barkley lead the offensive attack for the Miami Dolphins, the team must look towards drafting former Baylor quarterback Robert Griffin III (RG III) or trade for Luck. It will be hard in drafting the Heisman trophy winner and Luck since each player would be difficult for team to pass on them. The USC organization has to have smiles on their faces with Barkley staying. He is an upcoming Heisman in years to come and could potentially lead the team to a BCS championship. 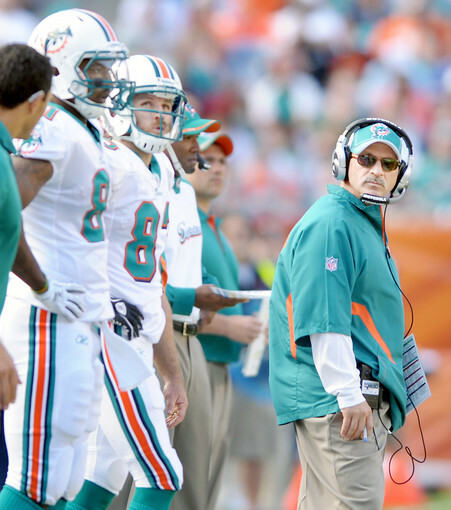 Hours after the Kansas City Chiefs said good-bye to head coach Todd Haley, the Miami Dolphins dismiss head coach Tony Sparano. The former coach joins the list of Jack Del Rio and Todd Haley for fired coaches in the 2011-12 season. 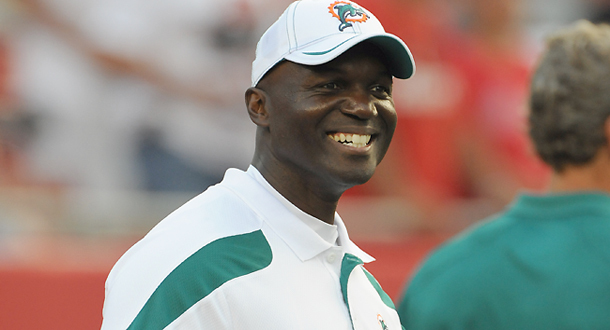 Was the firing tough luck or bad coaching from the former Dolphins’ coach? In result of many season-ending injuries including starting quarterback Chad Henne, there was thought to believe head coach Tony Sparano would receive a free pass this season, but oh boy was I wrong. In Miami, the former head coach had some flaws with his performance numbers. He posted a 29-32 record, not making the playoffs three out of the four years under management. It is frustrating from a president’s perspective when you have talent and they don’t show weeks in and weeks out. In order for the team to stay intact you must put the blame on the man running the team. The highly competitive and free-spirited coach was fun to watch, very classy in the locker-room, and a players’ coach at heart. Throughout every game of the season whether it be the first week or last, you would see him hyping up and appaulding his team on the sidelines for their contributions on the field. Tony Sparano will be missed as head coach of the Miami Dolphins but it is time to move on and take a different direction for the good of the franchise. When quarterback Matt Moore went down with a head injury in week 13, I could tell their could be a rebuilding process in the making, just a matter of when. Another note, Jeff Ireland hired former Kansas City Chiefs’ president Carl Peterson to fill in the executive vice president of football operations position, which was once managed by Bill Parcells. The Miami Dolphins were struggling to find any rhythm or momentum and were gradually stopped by the Philadelphia Eagles 26-10 in Sun Life Stadium Sunday afternoon. In the past two games, the Dolphins offense came early and fast. The first drive of the game for the Dolphins fit the trend accordingly after quarterback Matt Moore connected with wide receiver Brandon Marshall for a 16-yard touchdown. After the exciting drive, the Dolphins’ suffered an injury they couldn’t afford. Jake Long, the offensive tackle pro bowler, left early in the first quarter with a back injury. Subsequently, the offensive line had a hard time keeping quarterback Matt Moore secure. The next five drives starting in the third quarter, brought the worst out of the Miami Dolphins as turnovers and injuries became prevalent. A pattern including a punt, missed field goal, interception, and two fumbles stopped the home team from scoring. Matters became worse in the third when quarterback Matt Moore left the game with a head injury. He finished with 95 yards, one touchdown, and one interception. With back-up quarterback J.P. Losman replacing Moore, there was little hope that the Dolphins could come back from a 24-10 deficit. Losman recorded 60 yards in the loss. The only upside Miami had was running back Reggie Bush. He was the enforcer throughout the entire game on the offensive side of the ball, and tallied 14 carries for 103 yards. Philadelphia erupted into a dominating force on the defensive side of the ball recording nine sacks in the win. Eagles’ defensive ends Trent Cole and Jason Babin sacked the Dolphins’ quarterbacks a total of six times in their victory. A comeback performance for Eagles’ quarterback Michael Vick consisted of 208 yards, one touchdown, and one interception. The Miami Dolphins have three games and must finish strong and let this season go as their chances at making the playoffs are slim to none. Don’t forget to check out the Buffalo Bills preview later in this upcoming week.